Smart Card has been introduced for Lahore Metro Bus Service. Metro Bus Authority (Government of Punjab) introduced this new smart ticketing system for passengers of Metro Bus Service. 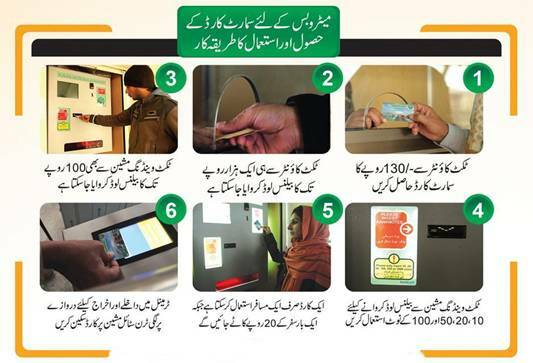 Passengers of Metro Bus may now get and use smart card for payment of fares. This is a convenient and time saving way of paying tickets. Below we have shown; how to get a smart card, how to load balance in it, card price, fares, route maps etc. Lahore Metro Bus Service is Pakistan's first Metro Bus Service. It was started on 10 February, 2013. Smart cards are based on secure RFID technology. These are durable and credit card sized. 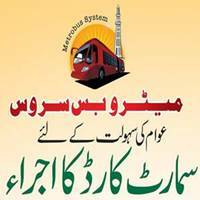 Also visit "City Guide of Lahore - The City of Endless Marvels"
How to Get Metro Bus Smart Card? Smart Card can be obtained from Ticket Counter for Rs.130. You can load balance upto Rs.1000 from the counter. You can load balance upto Rs.100 from Ticket Vending Machine. Use only Rupees 10, 20, 50 and 100 notes on vending machine. How to Use Smart Card? Scan your Smart Card on turn style machine at entrance and exit doors of terminal. A smart card can only be used by one person. Guides are appointed on E-Ticket Machines and Bus Stations. Flat fare of Rs.20 will be charged per journey. People with valid smart cards and sufficient balance can proceed directly to platform after scanning this card on scanner without waiting. Single ride ordinary tokens can also be used which are purchased at entrance and deposited at the time of exit.